Thames Discovery Programme - TDP to feature on COAST! TDP to feature on COAST! Low-lying London is very vulnerable to flooding as recent events have shown all too clearly. During the Blitz, this threat was even more pronounced, since the Luftwaffe might all too easily destroy our flood defences and inundate the city. Mindful of that awful possibility, the London County Council’s Chief Engineer Sir Thomas Peirson Frank set up a top-secret rapid-response team dedicated to ensuring that London’s riverwalls would be immediately repaired in the event of a bomb strike. This initiative proved heroically successfully: in spite of an incredible 122 direct hits on the waterfront from 1940-1945, not one of those potentially-catastrophic events flooded London. The work of this team was conducted in such secrecy (so as not to alert Herman Goering to London’s vulnerability) that hardly anybody knew of their work: the contribution that Peirson Frank made to the saving of London in those dark days had only recently been revealed by the Thames Discovery Programme team. Their research in the London Metropolitan Archive and their survey of surviving river wall repairs still visible today have enabled us to appreciate this forgotten story from the Blitz for the first time. We feel that Sir Thomas Peirson Frank deserves belated recognition for saving London from drowning, and his work will be the focus of a feature on BBC’s COAST. 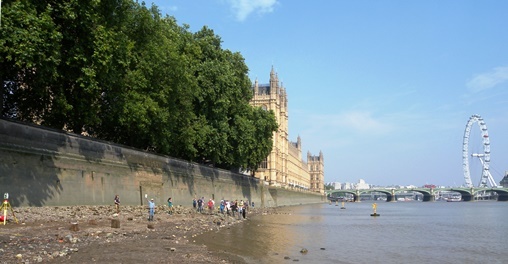 In October 2013, COAST filmed a short feature with the TDP on the bomb-strike site at Westminster, in the shadow of the Houses of Parliament, and this will be broadcast on Tuesday 12th August at 8.30pm on BBC TWO.